Can arsenic bind to bacterial DNA? In 2011, a paper published in Science claimed that bacteria from Mono Lake, California, US, had not only evolved to tolerate arsenic, but had incorporated it into their DNA. The paper led to criticism, with many scientists saying that the arsenate compounds formed would be unstable in water. Now, scientists from the US and China say that arsenic substituted DNA may be more stable than first thought. 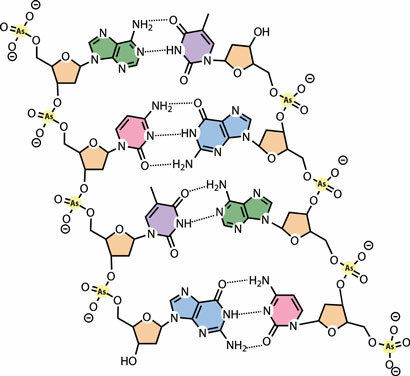 Jiande Gu and Jerzy Leszczynski and colleagues from Jackson State University and the Chinese Academy of Sciences ran a computational study that revealed that the base-stacking structure of DNA could increase the resistance of the arsenate towards hydrolysis, compared with current arsenate models. ‘However, our study also suggested that arsenated DNA (As-DNA) is still less stable than normal DNA when hydrolysis is considered,’ says Leszczynski. 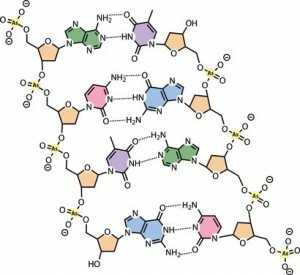 ‘Normal’ DNA has a backbone made of sugar and phosphate groups joined by phosphodiester linkages. Arsenic replaces the phosphorus in As-DNA.